"Let’s go," all three leaders said as they sat alongside each other to sign multiple copies of the deal. They then shuffled binders around in front of them, to finalize the deal that remakes one of the world’s largest free trade zones. When the signing was over, they paused for a photo-op. "Might as well hold that up," Trump said, displaying the fresh signatures as the three leaders sat together. 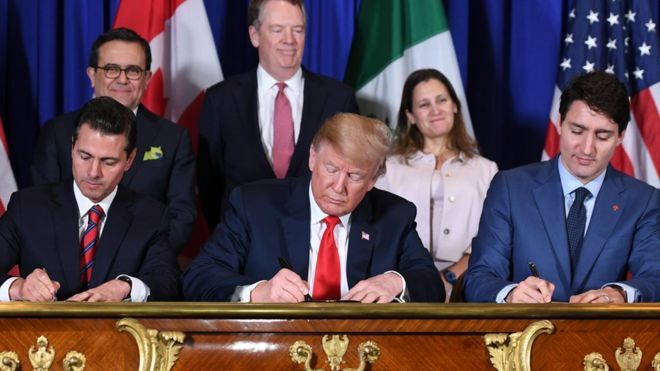 In the lead-up to the signing, Canadian officials had "made it clear they didn’t want to celebrate the end of a year of U.S. attempts to twist Canada’s arm with the tariffs still in place," the CBC reports. But that wish ran counter to the desires of Trump and Peña Nieto, both of whom have preferred to portray the deal as a victory that helps to cement their legacies. "The biggest change this deal makes, really, is to the automotive sector," NPR’s Scott Horsley reports, "where it does put higher requirements on North American content, and in particular high-wage content, for vehicles to trade duty-free." Turning to address Trump, said "And Donald, it’s all the more reason why we need to keep working to remove the tariffs on steel and aluminum betweehttps://www.wsj.com/articles/gm-say...n our countries." The move "shocked many in Mexico," as NPR’s Carrie Kahn reported earlier this week, referring to the outrage and anger that has poured out online. Later Friday, Trump will turn to another high-profile trade crisis, when he has dinner with Chinese President Xi Jinping.